We	use	a comprehensive	evaluation	process	to	build	a	whole-person	understanding of	clients’	deficits	that	are	inhibiting	participation	in	daily	life. This	process	includes a	detailed	parent,	caregiver	and/or	client	interview. Prior	to	interview	a	questionnaire	is	completed	to	provide	information	regarding	clients’	birth,	developmental,	and	medical	history,	and	performance	skills	effecting	participation	in	daily	life. Therapists	also	utilize	skilled	clinical	observation	and	formal	assessments	as	needed	to	gain	a	baseline	of	the	clients’	abilities. Observations	of	clients in	school	and	home	settings	may	also	be	used	to	better	understand	behavior, skill	use,	and	interactions	across	environments. Following	evaluation,	our	therapists	develop	treatment	plans	using evaluation	results; parent,	caregiver,	and	client	input;	and	clinical	judgment. Therapist	and	families	will	also	determine	if	these	goals	are	best	met	with	individual	or	partnership	treatment	methods. Treatment	sessions	are	focused	on	building	developmentally	appropriate	foundational skills	via	play-based	and	child-directed	interactions. 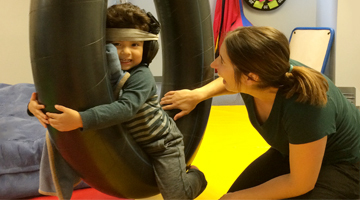 During	treatment, therapists focus	on	meeting	the	child	at	his	or	her	level	and providing	the	“just	right	challenge”	to	promote	growth	and	support	nervous	system	development. Therapists	also	provide	parent	and	caregiver	education	to	encourage integration	of	techniques	into	the	home	and	community	environments. School	and	home	visits	may	also	be	utilized	to	build	home	programs	and	promote	success	throughout	all	areas	of	clients’ daily	routine.